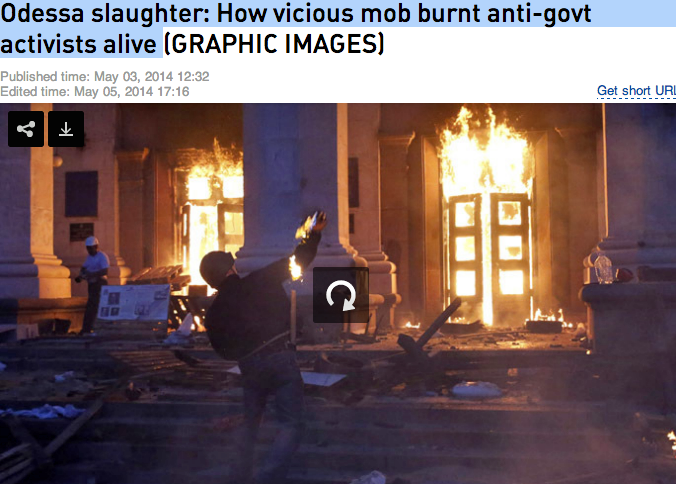 ODESSA SLAUGHTER: OVER 30 PEOPLE BURNED ALIVE BY PRO-WEST UKRAINIAN MOB – TRUTH IN MEDIA: TRUTH TRUMPS POWER EVERY TIME! Why are the US media mostly mute about the Odessa slaughter? “Truth in Media?” Not in America. At least 42 people died in Odessa this weekend, over 30 of them burned alive by pro-Ukrainian government mob which Washington supports. Yet there has been a scant mention of this travesty in the major American media outlets. Instead, the lead stories served up to the dumbed-down nation are about the Supreme Court ruling on public prayer and 200 Nigerian school girls’ abduction. Meanwhile, at least six of the people jumped to their death in Odessa out of the windows of the burning building. And if that does not evoke memories of 9/11 and the World Trade Center, then what will? Clearly, the Washington New World Order mobsters and their media patsies do not want Americans to see what their proxies in Odessa did, lest we make such an association. Which is why anyone seeking to learn the full truth about what is happening in Ukraine needs to see this report. Dozens of people died in flames in Odessa, when radicals set ablaze the local House of Trade Unions with anti-government protesters blocked inside. The city is now in mourning for those who died, suffocated in smoke or had to jump out of windows. What triggered the tragedy were violent clashes, which erupted on Friday afternoon between two rival rallies in Ukraine’s port-city of Odessa. Around 1,500 supporters of the Kiev authorities, accompanied by aggressive fans of the local football club, Chernomorets, tried to march through the center of the city chanting “Glory to Ukraine,” “Death to enemies,” “Knife the Moskals [derogatory for Russians].” Some of the people in the group were wearing ultra-nationalist Right Sector movement insignia, were armed with chains and bats and carried shields. Next PostNext HOW LONG WILL BUSINESS LEADERS TOLERATE A SCHIZOPHRENIC PRESIDENCY?